If you need to put on weight quick, you should go for a serious body mass gainer like Optimum Nutrition Serious Mass Weight Gainer. Why? Read on and find out. Nutrition. Right off the bat, you will see that this products nutrition profile is not a joke. 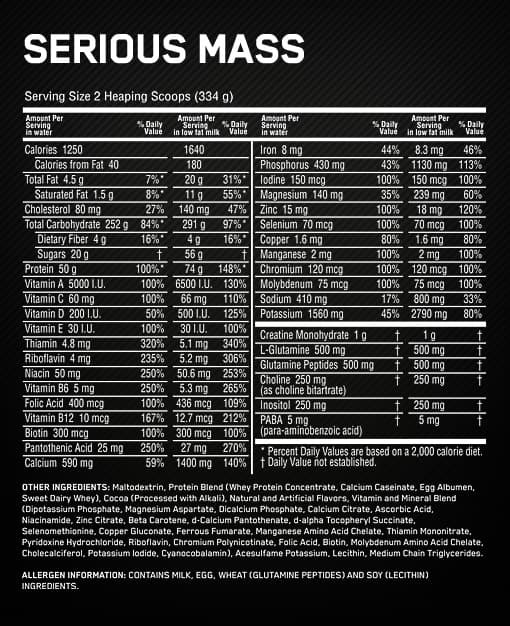 With 1250 calories for every serving, you would know that Optimum Nutrition is really serious about their objectives. The serving size is huge, though, so you can opt to go for half-servings, which would already meet your calorie needs for the day, however, your protein intake is slashed to just 25 grams. What you can do is to add a scoop of any whey protein to make up for the displacement. A full serving will give you 252 grams of carbohydrate and 126 for half a serving, which is a good number if you want to carb up for strength training or heavy workout. The Optimum Nutrition gainer has very low fat content so you are assured that you’d only have lean mass when you bulk up. Taste. Serious Mass has a chocolate flavor, which tastes great. You have to mix it really well with a blender, though, otherwise it gets clumpy and lumpy. The other flavors are protein-y, which is why I stuck with the chocolate flavor. Dosage and Effectiveness. Out of 10, I’d give it a score of 8, because with just a 6kg bag, you can gain up to 5 lbs even with half servings. This product is perfect for hard gainers or busy individuals that don’t have much time to prepare meals. You can take it with your breakfast or lunch, or have it with a high protein/calorie snack. Great Value. A tub with a 6 kg bag sells for $40, which is a great value for the weight gaining punch it packs. The packages gives you 16 full servings, making it just $2.50 per serving. If you really get down to a per serving price comparison, there are other weight gainers in the market that are cheaper, however, you get a hefty amount of weight gaining ingredients for your money’s worth with Serious Mass. The biggest turn off to this product is the mixing and the consistency. It is so difficult to mix and get the lumps out. Even with a blender, and a little bit more water or milk than usual, the texture still turns out clumpy. Indeed, it is easier to mix cement. Optimum Nutrition Serious Mass is an excellent product and is ideal for those who are seriously looking for additional bulk and pack on pounds with unadulterated calories. Weight gain is guaranteed, and coupled with proper training, you get lean, serious mass.